I couldn't finish my homework because I didn't have graph paper. I couldn't finish my homework because I didn't have my graphing calculator. I couldn't finish my homework because I didn't have my calculator. I couldn't finish my homework because I don't know how to use my calculator. I couldn't finish my homework because I don't know how to convert units. I couldn't finish my homework because I didn't have any examples. You've only got to teach math for a few weeks before you've heard every one of those excuses. 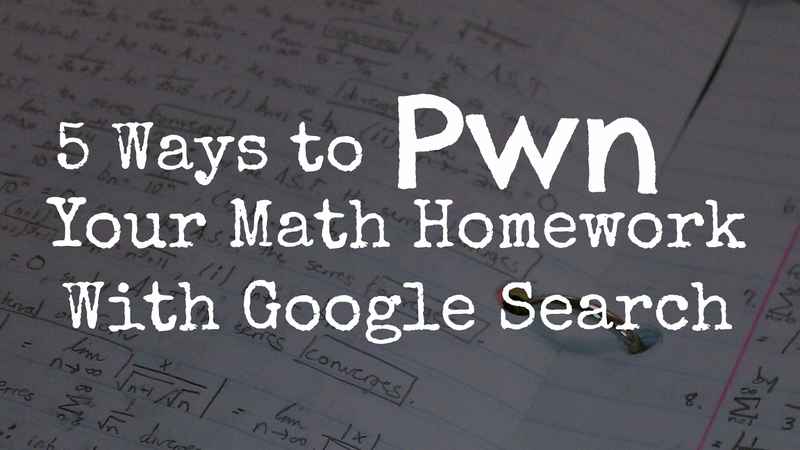 No one answer is going to be good enough for the kid that goes through all of those, but you can use a simple Google search to perform many necessary tasks to "pwn" your homework and save time. All of these tips work simply by typing in the search box on Google.com, or using the "omnibox" on browsers like Chrome and Firefox. Typing in calculations such as -1*-3 pulls up an onscreen scientific calculator that gives you an answer and allows you to continue with my calculations. 2. Find and print graph paper. 3. Graph equations and trace for points. No need to even go to a graphing calculator app or website. Trace along the line to find intercepts, coordinates, and other key features. You may still need to show your work (especially if you're in a lesson on the topic), but this will at least check your work. 5. Solve systems by graphing multiple equations at once. Separate with a comma. Trace along the line to the intersection and approximate the coordinates. BONUS: Find a video tutorial without going to YouTube. Many graph or calculation searches will also bring up relevant video results that you can play from the search screen. For more info, all of the documentation about the Google calculator and grapher can be found here.